NOTE: THIS PAGE IS A WORK-IN-PROGRESS AND IS CONSTANTLY BEING UPDATED. The HD Retrovision YPbPr train is finally pulling into the PlayStation. Coupled with our freight engine (the Genesis YPbPr Component Cable), the PlayStation adapter will take your console on a cross-country journey to Clarity Town, USA. Just sit back, relax, and enjoy the experience on an HDTV that supports 240p, or on a standard-definition CRT for that classic look. The following chart contains a list of tested and confirmed console models which have been verified to work with the PlayStation adapter. The intent of this list is to give a general idea of what types of consoles can work with the adapter, and is not exhaustive. Therefore, we expect the adapter to work with even more models and console types than what is listed, but we are unable to explicitly put them in the list unless functionality is directly confirmed by us. * Although the PlayStation adapter will work with PlayStation 2 and PlayStation 3 consoles, RGB/SCART output needs to be enabled in the system menu and even then it can only operate properly in the standard definition video modes (240p/288p/480i/576i). Additionally, the built-in DVD/Blu-ray Player application in these consoles is restricted from using RGB/SCART mode, so DVD/Blu-ray playback won't display properly when set to this mode. 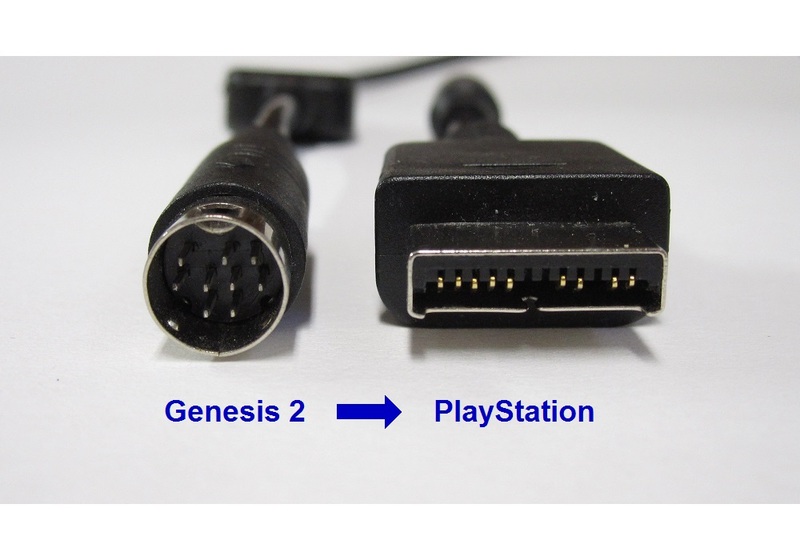 If this missing functionality is important to you, we recommend using our PS2/PS3 YPbPr cable (see below chart).  These models have standby power while plugged in, regardless if the console is powered on or off. This standby power keeps the audio mute circuit activated on the audio outputs. Therefore, using these consoles with the Y-adapter input splitting method described on this page (under "YPbPr Component Switchbox Alternatives") will cause a severe reduction in audio volume with whatever else is connected together with the PlayStation console. The only way around this is to remove the AC power input from the PlayStation when not in use by either turning off the rear power switch (if available), unplugging the AC cord, or turning off the power switch on a connected surge-protector / power-strip. Are PlayStation 2 and PlayStation 3 already retro, or are we betraying the name of the company? Hopefully it's the latter, because otherwise we'll feel really, really old. Well in any case, now you can enjoy PS2/PS3 in beautiful YPbPr component video before you become worm food! Why'd we waste our time developing a product that already exists on the market, you ask? Simple! The official PlayStation 2/3 YPbPr cables are often expensive, and almost all third-party solutions are severely lacking in quality. We're here to help solve this problem by giving you the high quality shielding you know us for at an affordable price. No compatibility list needed here, since all PlayStation 2/3 consoles natively support YPbPr, as long as the display settings are properly configured (see our Troubleshooting page for more information and instructions). NOTE: As mentioned on our 3rd Party Products page (under "YPbPr Component Switchbox Alternatives"), the PlayStation 2/3 YPbPr Cable does not include circuitry to prevent the leaking of Y-adapter split video signals into a PlayStation 2/3 while it is powered off. Therefore, it is not recommended to use that method to connect a PlayStation 2/3 to your equipment if full signal integrity is desired. Additionally, all PlayStation 2/3 models have standby power while plugged in, regardless if the console is powered on or off. This standby power keeps the audio mute circuit activated on the audio outputs. So using PlayStation 2/3 consoles with the Y-adapter input splitting method will cause a severe reduction in audio volume with whatever else is connected together with the PlayStation 2/3 console. The only way around this audio muting is to remove the AC power input from the PlayStation 2/3 when not in use by either turning off the rear power switch (if available), unplugging the AC cord, or turning off the power switch on a connected surge-protector / power-strip.